The order in which the telephone book contacts in FRITZ!Fon are sorted depends on how the names were entered in the FRITZ!Box telephone book (first name / last name or last name / first name). If you enable the search mode "Last name" in FRITZ!Fon under "Menu > Telephone book > Options", you can change the sorting order according to last name. If your telephone books contain many entries, we recommend using the "Vanity" search mode that you can also enable under "Menu > Telephone > Options". This search mode takes the first and last names of your contacts into account and each time you press a button, the number of possible entries displayed is reduced. Normally you must press a button just two or three times to find the contact you are looking for. 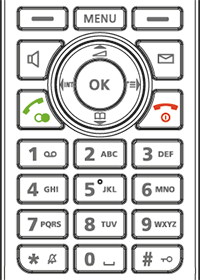 Press the 7 button to see all of the contacts whose first or last names begin with "P", "Q", "R" or "S". Press the second letter of the name to narrow the search results: If you press the 2 button, you will only see the contacts named "PAul", "SAbine", "SChmidt" or "RAabe".